Please find the entry form below. Descriptions of categories are offered at the bottom of this page. You may select more than one category for a title on each form. For a new title, please submit the form and fill out a new entry. 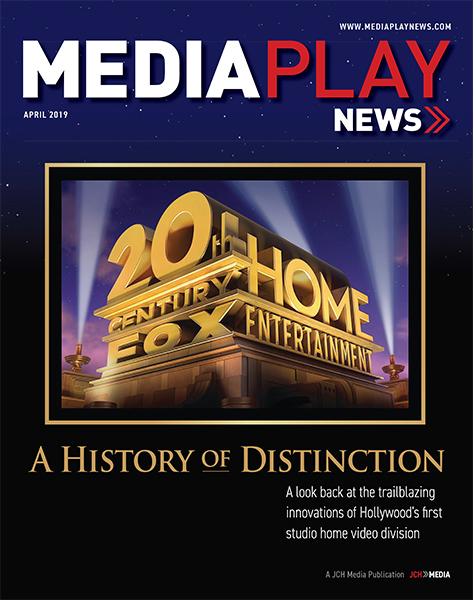 You may submit multiple titles through one entry form by selecting the Multiple Submission option and emailing a document listing submissions to jlatchem@mediaplaynews.com. Sign up for future Awards notifications here. The Home Media Awards presented by Media Play News honor the best home video releases of the previous year, as judged by a blue-ribbon panel of industry experts as well as consumers. The announcement of winners is slated for our April issue. Winners receive an award trophy and are prominently featured in Media Play News, both in print and on our website, and are also publicized through consumer press outreach. For questions on the submission process or eligibility of titles, contact John Latchem at jlatchem@mediaplaynews.com or 714-485-5047. Eligible titles for submission will have been released on home video between Jan. 1 and Dec. 31 of the recently concluded year. A panel of judges will choose nominees in each category based on the entire disc treatment — transfer quality, sound and picture, menu design, ease of use, navigation, packaging and other elements relevant to the disc and category. The entry fee is $200 per title, per category (i.e., one title in two categories = $400). At $10,000 studios will be granted unlimited entries. You will be asked to send at least 5 finished-product copies of each title submitted. If the same title is submitted to multiple categories, an additional 5 copies may be requested. Digital categories may require access to the film or TV show via a link or code. Submissions to this category for titles that were also released on disc may require a submission of that title in one of the disc categories as well. Valid product for judging digital titles will consist of either a digital copy included with a disc version, or a digital copy code for a final consumer market version. Digital screeners will not be considered. The deadline for submitting entry forms is Friday, February 22, 2019. Product submissions will be arranged through follow-up correspondence and do not strictly need to be in hand by the paperwork deadline. Do not send judging copies via messenger. A standard method of shipping through Fed Ex, UPS, USPS, etc., will be sufficient. You may submit Blu-ray versions of titles to all categories, but some HD categories (as marked) require only Blu-ray submissions. If you are submitting a title to multiple categories, one of which is an HD category, then your product submissions must be in the Blu-ray format. You may submit a title to more than one category on this entry form. Please select the categories you wish to enter the titles into. If later you wish to submit the title to an additional category, or would like to submit a different title to one or more categories, please use a new entry form. You may also submit multiple titles using one form by selecting the multiple option and emailing a spreadsheet or other document listing multiple submissions using only one form, without having to re-type the contact information. Please read this form carefully. Not all fields are required to be filled out. Titles will be judged by a blue-ribbon panel and nominees will be offered for a consumer vote in March and April. A selection of winners will be picked by the judges directly. A Title of the Year, a TV DVD of the year and a Blu-ray of the year will be selected by the judges from among all entries in all the disc categories. These are not separate categories for submission. To be considered for these “Best of Show” categories, please submit your title to least one of the disc categories that corresponds to the general “Best of Show” segment (i.e., a TV DVD category for TV DVD title of the year, an HD category for Best Blu-ray, etc.). If there is not sufficient interest in sponsorships for an awards event, results will be printed in Media Play News, which will constitute the official announcement of the winners. Trophies will be shipped to the winners provided all entry fees have been paid. Awards organizers reserve the right to adjust entries based on appropriateness or to create additional categories or cancel categories due to interest level. This form is no longer accepting submissions. Sign up for our awards list and be notified of future winners and the submission period for next year. Best Theatrical Title on Disc: A movie that played within the past two years in theaters (beyond just a festival run or limited showing for promotional value) and made its debut on disc during the eligibility year. For this category, please also enter the theatrical release date, box office earnings and budget in the fields below. Best Direct-to-Video Movie: A movie that premiered on a disc format during the eligibility year. Best Catalog Movie on Disc: An older movie released on disc for the first time or being re-released on disc in a new edition (DVD and Blu-ray versions available). This category is generally not for films being released only on Blu-ray when a DVD already exists, nor is it for TV titles or collections of more than one film. If you have a Blu-ray only release of a catalog title, please submit it to the Upgrade category. Best Title Upgrade: A re-release intended to replace an earlier release, such as a special edition with new content, a Blu-ray version of a previously released DVD, or a boxed set of films that had been released one at a time. The idea is that the Blu-ray or DVD special edition is an upgrade from the earlier disc, usually through a restoration process or new extras. Thus, it is a good incentive for those who already own that disc to upgrade to this new one. Best Restoration: This category concerns the improvement of picture and sound quality of a film from an earlier version, or repair work done to a film. Best Packaging: This category is for products that display some sort of innovative box design. This is not a category for regular DVD/BD cases that contain nice box art, but for DVD/Blu-ray cases that are unique to the product being sold. Packaging may also include collectibles within the box. Best Box Art: This refers to the artwork on the DVD/BD case, in most cases the front cover of a regular DVD/BD case, including lenticular covers. Best Movie Collection/Boxed Set: This category is for collections of films, either a collector’s edition of a single film, a franchise set, or an anthology of films or other content that is not a TV series set. Best Complete TV Series Set: A complete collection of a series or a multi-season boxed set. This is for complete series sets that are more than one full season. For those releases (generally 10-30 episodes) please enter into the Current/Contemporary/Vintage Categories. Best Current Series: A season set of a series with episodes that are from the season concurrent with the contest year, with those episodes making their disc debut in this set. This category is for single-season sets or equivalent volumes (single-disc or complete series of shows that ran only one season or possibly two seasons, and not repackaged from earlier separate season sets). This is a category for shows that are currently on the air or recently ended their run. Best Vintage Series: A season set of a series with episodes that aired before the eligibility year. This category is for single-season sets or equivalent volumes (single-disc or complete series of shows that ran only one season or possibly two seasons, and not repackaged from earlier separate season sets). Please note, if you are submitting a DVD/BD set for a show that is currently on the air, but the episodes are from several seasons ago, it likely belongs in this category. Best Miniseries or TV Movie on Disc: A DVD/BD of a limited series or standalone movie made for television. This includes direct-to-video titles not necessarily made for TV, but based on or tied into television shows. Best Audio/Visual Quality — TV: A Blu-ray Disc of a TV show, miniseries, TV movie or TV special. Best 3D Disc Release: This category is specifically for 3D Blu-ray titles, designed to work on 3D-equipped TVs and Blu-ray players. Submissions may include 3D titles distributed through regular consumer channels or special discs available only through bundle purchases. Best Animation Disc: A DVD or Blu-ray of an animated movie, TV program or special, regardless of intended audience. Best Documentary Movie or Special on Disc: Content that is not fictional in nature, usually a documentary, whether it was shown in theaters, direct-to-video or on TV. This category is not intended for series, though individual, independent entries of a larger series that are released on their own on disc may qualify. Sports highlight films belong in this category. Documentary miniseries belong in this category. Best Reality/Documentary TV Series: This category is for nonfiction TV series on disc, such as reality shows, variety shows, or ongoing documentary-type shows. Best Extras/Bonus Material: This category focuses on the bells and whistles of a disc release, and not the movie or TV show at the center of it. Best Compilation/Themed Release: A collection of content from varying sources, shows or franchises, or a combination of TV and movie content. Best Kidvid Disc: This category is for discs aimed at younger viewers, be it an animated movie, cartoon or sitcom for kids, or an educational video. Best Sports Disc: This category is for discs that contain sports content, such as event broadcasts, highlight videos, athletic exhibitions, etc. of live sporting events. It is not for fictional sports movies (unless the extras contain significant live sports content, such as a game broadcast). Best Fitness Disc: This category is for discs in the workout/fitness genre. Best Music/Performance DVD or Blu-ray: This category is for live performances, stand-up comedy, variety shows or stage plays, or similar content, on a video disc, such as concert films or collections of music videos. Best Foreign Film on Disc: This category is reserved for discs of foreign-language movies. Best International TV Show on Disc: This category is for discs of TV programming produced outside the United States, or in a foreign-language, such as telenovelas or anime series. Best Indie/Small-Budget Film on Disc: This category is intended for independent distributors whose films are not as widely known as major studio fare. To enter this category, please enter the budgetary data in the space below and any additional information about the film if it was theatrically released. Direct-to-video titles are also eligible for this category. Best Comedy Disc: This category is for films or TV shows in the comedy genre. Stand-up comedy specials and variety shows with comedic content are eligible. Best Fantasy Disc: This category is for films or TV shows in the fantasy genre. Best Sci-Fi Disc: This category is for films or TV shows in the sci-fi genre. Best Action Disc: This category is for films or TV shows in the action genre. Best Adventure Disc: This category is for films or TV shows set in the adventure genre. Best Drama Disc: This category is for films or television shows presenting a dramatic storyline that might not otherwise fit a genre category. Best Horror Disc: This category is for films and TV shows of the Horror genre. Best Thriller Disc: This category is for films and TV shows of scary, psychological or darker content. Best Musical Disc: This category is for films and TV shows of musicals — typically filmed narratives containing key scenes that substitute dialogue for song. Best Disc of a Western: This category is for films and TV shows of Westerns. Best Marketing Initiative: This category is for programs to market and create awareness of films or TV shows, or for creative tie-ins. Best 4K Ultra HD Blu-ray Disc: This category is for films and TV shows released on the 4K UHD Blu-ray format. Best Faith-Based Title on Disc: This category is for faith-based or religious themed content, fictional or non-fictional in nature (aka dramatic narratives or documentaries). Best Digital HD Movie and TV Show: A title released via streaming and/or download. To be eligible for these categories, titles must have been released only via digital delivery during the eligibility period, or a disc version of the title was submitted in another category. This is for final consumer versions of the content, not screeners. Note: In general, a film or TV show can only qualify for one genre category. These categories will be chosen by judges from among all eligible submissions. Title of the Year: This award will be chosen from among all submissions. Best TV DVD: This award will be chosen from among all submissions that are TV DVDs, whether they are submitted into the specific TV DVD categories or in a general category. Best Blu-ray: This award will be chosen from among all titles for which a Blu-ray version was submitted, whether they are submitted into the specific high-def categories or in a general category. Titles for which a Blu-ray version exist, but for which only DVD copies were sent for judging, will not be considered.